Popular among novice DIYers and hand lettering masters, Marvy’s Bistro markers are the perfect companion to our acrylic and metal prints because using the marker, you can write a message on each print. 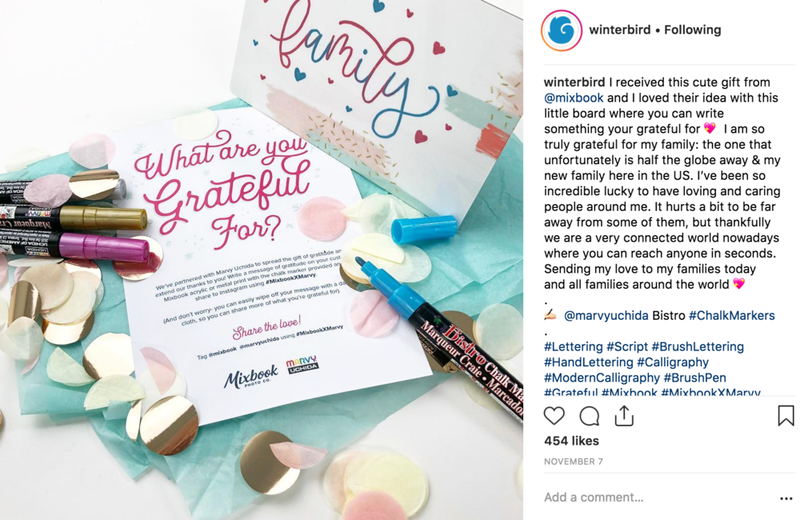 What’s even better is you can easily wipe it off and write another when you’re ready to change it up— providing a fun way to spread messages of gratitude and joy all year around! To help spread the word and spark some inspiration, we sent several of our favorite hand lettering masters a sample metal print and a set of Marvy Bistro markers. We asked them to share what they are grateful for. Ida of @winterbird shared what she is most grateful for – her family. Younghae of @logos_calligraphy is grateful for the things money can’t buy, like the time she gets to spend with the people she loves and cherishes the most. And Desiree @herhazeleyes.studio shared something we are all grateful for— fries. Now through mid-January, any acrylic or metal print you order will come with a Marvy Bistro marker as a gift. Whether you’re jotting down notes, spreading love to someone who needs it, or adding a little flare to your print, this gift makes your customizable Mixbook print more unique. Customize your own acrylic and metal prints here! Be sure to share your designs with us on Instagram by tagging @Mixbook and using the hashtag #MixbookXMarvy! Happy creating!